The OS-651 thermometer is rugged, compact and easy-to-use for non-contact temperature measurements in industrial and maintenance applications. Fast and accurate, Models OS-651 and OS-651-LS (with optional laser sighting) both feature adjustable emissivity from 0.10 to 0.99, making them well suited for surface measurements. 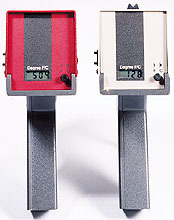 Both have standard 0.1 mV per degree output which can be sent to a recorder or datalogging device. The Model OS-651-LS features a laser sight for applications that require precise sighting to ensure accurate measurements. Note: Each unit supplied with 9 V battery plus complete operator’s manual.